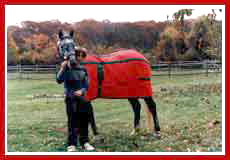 In 1985, I started Horsewash Equestrian Laundry. 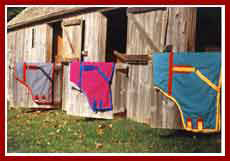 Washing hundreds, then thousands of blankets per year, I saw the advantages and disadvantages in blankets. I decided to market my own, with my first priority being the horse and my second the laundering. 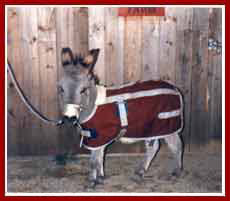 Before getting into horses, I had been an avid skier. I remembered how warm and lightweight Thinsulate® Thermal Insulation was for skiers in the frigid temperatures of the New England mountains. By using different weights of Thinsulate® Thermal Insulation and high-tech fabrics, combined with classic designs and strong innovations, we’ve developed a lightweight breathable warm collection of original horse clothing. Our goal is to grow with technology. We invite you to share this fine collection with us. 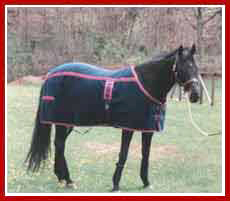 Please call (401) 231-7999 or send an Email for a quote on HORSEWARM products.